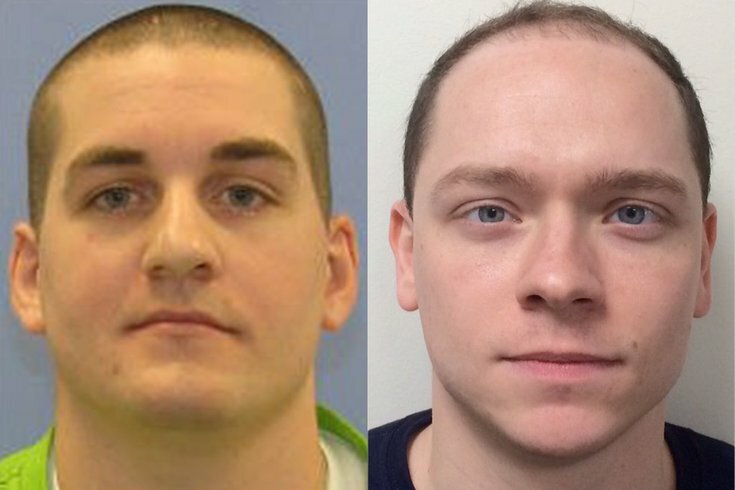 Officers David Simcox, 29, left, and Johnathan Lanciano, 29, were fired in January after an Internal Affairs investigation, according to SEPTA police. They face assault charges in the December incident. Two SEPTA police officers have been charged with allegedly assaulting a man at the Frankford Transportation Center last year. David Simcox, 29, and Johnathan Lanciano, 29, were charged Thursday for allegedly attacking the man without provocation while responding to a call of an intoxicated person near the tracks. An Internal Affairs investigation by agency police determined the officers punched the man several times, resulting in injuries that included a broken nose. The officers were fired earlier this year after the Internal Affairs probe, which included a review of footage captured by station surveillance videos and body-worn cameras. Internal Affairs investigates any incidents in which officers claim a person physically resisted them, according to SEPTA. In this case, investigators found no evidence supporting Simcox and Lanciano's claims that the man physically resisted them. The Internal Affairs investigation found that the man was sitting with his legs dangling over the edge of the train platform when the officers responded to the scene at 12:32 a.m. on Dec. 12. He did not strike the officers or make any movement that could have been construed as reaching for a weapon, the investigators determined. The man was not found in possession of any weapons, SEPTA police said. Simcox was charged with aggravated assault, simple assault, reckless endangerment and filing false reports. Lanciano faces charges of simple assault, reckless endangerment, filing false reports and harassment.